That should be pretty straight forward and is heavily dependant on your platform. 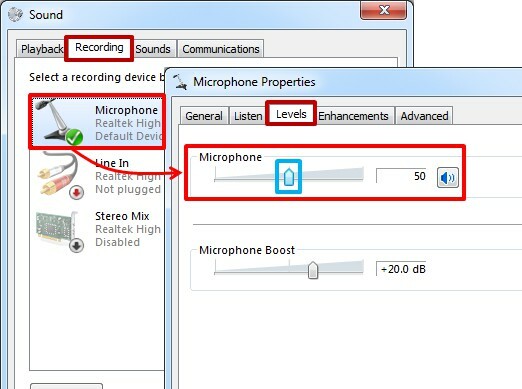 Before you start, make sure that the volume of your microphone is not set all the way in the control panel of your operating system. In the picture below you can see how to do this on windows 7. Now, go back your mumble, the first time your run mumble you will see the "Audio Tuning Wizard". If this does not start you can go to the Configure menu and open Audio Wizard. Now follow this wizard carefully to configure your audio. All communications in mumble are encrypted with certificates, a certificate is basically a digital autograph that you can encrypt things with. Mumble needs a certificate to be able to connect to a server. As we use password based authentication simply Automatic certificate creation will suffice. There are a lot of mumble servers out there, some of them are registered on the Public Internet server list. 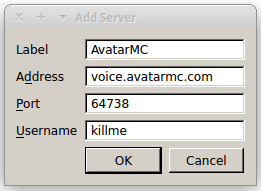 Now just enter some nice name in the Label field, enter voice.avatarmc.com into the Address field and enter an username ito the Username field. It should now look similar to the screenshot below. Now select the server and click on Connect. Note: You cannot connect with an username that is registered on the server without knowing the password. To setup push to talk, go to Configure and then Settings. On the Audio Input tab change the Transmit option under Transmission from Voice Activity into Push to Talk. Don't forget to also set a Push-to-Talk shortcut on the Shortcuts tab.